There are two kinds of people: those who enjoy bluegrass music for, say, 10 or 20 minutes before they tire of it, and those who can camp out for a few days at a festival and merrily listen to bluegrass 24/7. If you’re in the latter group, you’ll be glad to know that in Encinitas, there’s a weekly bluegrass jam at Today’s Pizza and Salad on Santa Fe Drive. The bluegrass classics aren’t performed with blindingly fast virtuosity because the jams are geared toward encouraging novice players to join in on the fun. The pickin’ might be a tad slower, but the good-natured vibe rivals any jam held in bluegrass meccas west of the Mississippi, such as Fort Collins, CO. Located in the Santa Fe shopping center (currently undergoing a cosmetic facelift), Today’s Pizza is somewhat inconspicuous. 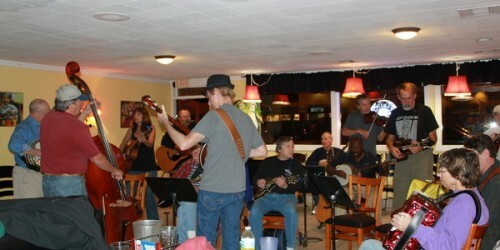 But every Thursday night, beginning around 6:30 p.m., the first of about 15 to 20 musicians trickle in. They form a semi-circle at the southern half of the restaurant and, beginning at 7 p.m., the first of many traditional bluegrass standards starts. Leucadia resident Gerry Rahill is one of the regular musicians and perhaps the most versatile. He plays Hawaiian four-string mandolin, siren whistle, kazoo, spoons and harmonica. 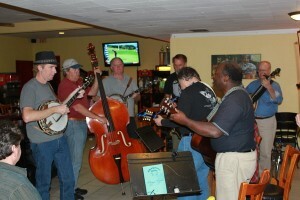 At about the same time Rahill began playing bluegrass, the film O Brother, Where Art Thou? spurred a bluegrass renaissance thanks to its successful Americana roots soundtrack, featuring the likes of bluegrass legend Dr. Ralph Stanley. 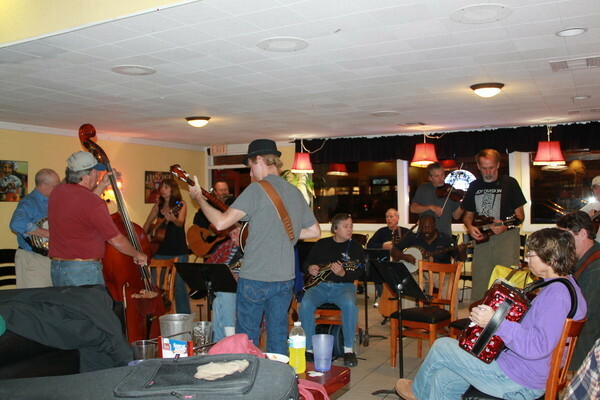 Several of the musicians at the Thursday night jam have only started playing bluegrass within the last few years. Susan Little of Oceanside has been playing for three years. The guitarist was originally more of a country music fan but has fallen for bluegrass. Little and the other relative bluegrass newcomers are rounded out by several veterans of the Thursday night sessions. Jason Weiss, who drives all the way from downtown San Diego, often acts as the conductor of the session. He picks out the songs, calls out the chords, guides the musicians through the rounds of leads and chorus and nods to the musician he wants to solo. In following with bluegrass tradition, Weiss guides the group with several signals. The family friendly vibes and folksy spirit are the reason many of these musicians return weekly and play in other groups. Stan Jones of La Costa is the group’s unofficial historian. His fondest memory of the weekly jams, he says, is the time a lady played the trombone with her toes. He says that the jam started in Cardiff at Besta-Wan Pizza House 15 years ago by “Banjo Bob” Cox, who has since relocated to Hawaii. The weekly jam has been at its current location for 10 years. Jones, who plays guitar and harmonica, also plays at Today’s Pizza on Wednesday nights, for weekly Hawaiian music jam sessions. “This is just good time music being played by good people,” he says, adding that several musicians in the group caravan to bluegrass festivals like the one coming up in early March at Lake Havasu. Jim Henderson, a five-string banjo picker, says that people are wrong if they think that the tradition of following musicians around to different concerts and festivals started with the Grateful Dead and their legion of Deadheads. Encinitas bluegrass fans can attend the yearly Summergrass festival in Vista. For more local bluegrass online, visit northcountybluegrass.org and socalbluegrass.org.